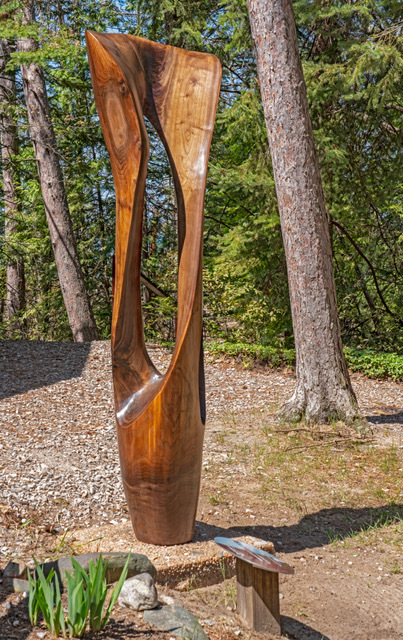 Hardwoods II, III and IV <br> <h2> Sam Soet </h2> — Art Rapids! Hardwoods III and IV were installed in the Walk of Art in 2018, joining Hardwoods II which was installed in 2016. 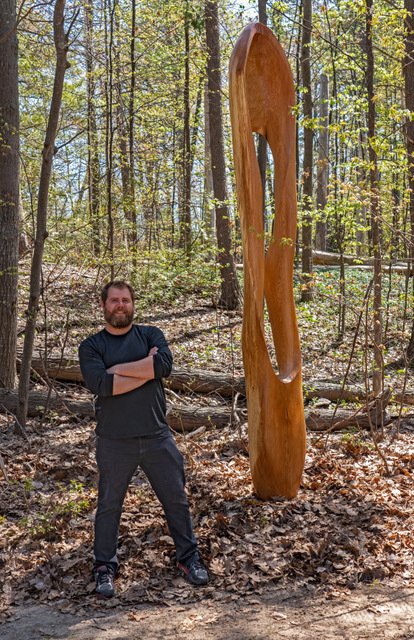 Sam Soet is a subtractive wood sculptor who currently works in central Michigan. Throughout his life he has studied all aspects of fine art and worked in many construction fields. Sam studied fine art at Ball State University and spent a summer learning the art of wood sculpture from master sculptor Leslie Scruggs. Sam’s work has been shown in California, Indiana, and Michigan. He enjoys working with wood because the medium itself is alive and it has a beautiful natural aesthetic. He works primarily in abstract forms because it opens up the possibility for personal interpretation and it allows him to work in collaboration with the medium. “I love working with wood because the medium itself is alive and has a beautiful natural aesthetic. Working in abstract forms opensup the possibility for personal interpretation and allows me to work more in collaboration with the medium. “My work is subtractive – I take a full sized log and utilize chainsaws, grinders mallet and gouges, rasps, and sandpaper to create the form. I finish the sculpture with oil. "I have also been told that people find it interesting that I am related to Vincent Van Gogh on my father's side and my mother was a student at Kendall College of Art. So it could be said that art is in my blood." Soet's sculptures have been on display in the Walk of Art since it opened in 2013. Please visit Sam’s website at www.samsoetart.com. 8' tall, base is 36' x 36"
For further information about the purchase of these sculptures, please contact us.